The long wait is over. 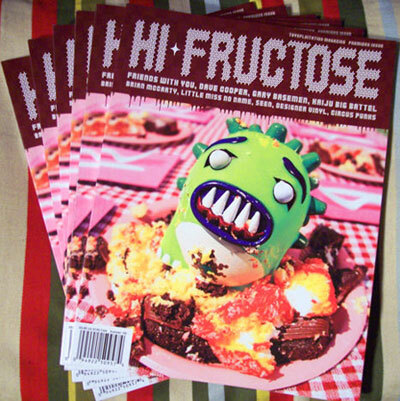 The first issue of Hi Fructose, then new art & culture magazine by Attaboy and Annie Owens, has finally arrived! It features Kaiju Big Battel, Gary Baseman, Dave Cooper, Circus Punks, Friends With You, Jenny Bird, Alex Pardee, The Life Size Mouse Trap, Gobler Toys and Tom Koch’s Opera Daisy/Toybending and much more. You can subscribe to Hi Fructose here or pick one up in person at any of these fine locations. Stay tuned for a Hi Fructose release party some time after Attaboy and Annie return from ComicCon. Keep up with the latest Hi Fructose Magazine news and information on their new blog.